We had the pleasure of meeting Josh Bear and Mike Henry of Twisted Pixel at PAX, easily one of the finer moments of the expo. Jason once again lead the introductions, at which point I blurted, "My wife won't let me play anything else! ", regarding runaway hit 'Splosion Man (pun intended). That's pretty much the case. As you can see by my GamerCard below, 'Splosion Man was the last title I played before leaving town for PAX. My wife loves it, and when she takes to a game there is no negotiation. It's her way or the Xbox gets smashed on the highway. What is it that sets 'Splosion Man apart from so many other titles? The answer can be found in another question, one that I asked Jason Booth of Bioware at the Designing for Failure panel: is it more appropriate for co-op play to be a means to overcome a challenge, or to bring its own unique challenges? I personally believe that co-op should always bring its own experience to the table, be it unique content or simply new ways to tackle existing challenges (as seen in the Gears of War series). 'Splosion Man further bucks the trend of "adding a player to make the obstacles easier" by completely changing level layouts, meanwhile still retaining a full roster of levels. This not only makes playing co-op a must for completists, it also ensures that one player cannot carry the weight -- all players are equally important. Coming from a studio of just 14 people, this mentality of equal worth isn't really a surprise, but it translates to the game so well that co-op is truly defined by titles like 'Splosion Man. We didn't just want to throw more players in just because we could. So the multiplayer levels are completely unique from single player, and have their own set of challenges to conquer. It's so simple it's genius! 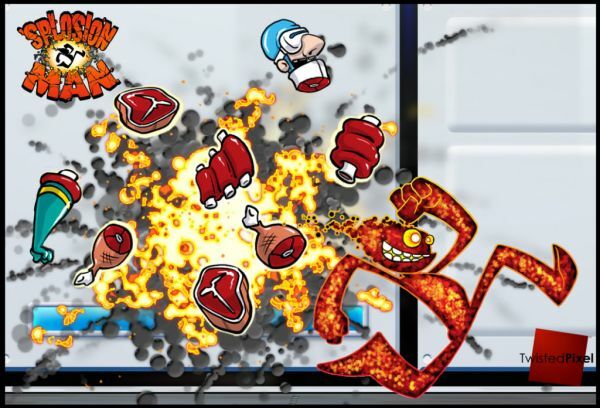 That's what 'Splosion Man is all about: one-button 'sploding, unique levels for multiplayer co-op, and plain old goofy fun. The quirky humor and odd choice of soundtrack mix for a barrel of laughs, especially when playing co-op. Normally, we draw these columns out a little longer, but being as I'm home sick today, I'm going to stop here and play 'Splosion Man. I just can't help myself!